Acidman's music might sound like indie rock, but just below surface, there's a mainstream appeal scratching to get out. Though dark and melodic, Acidman isn't too heavy-handed with its emotional music. You can't mistake the trio for Number Girl, but you won't mistake them for Glay either. The members of Acidman met while attending a private Western military school. It wasn't until college that they formed a band. 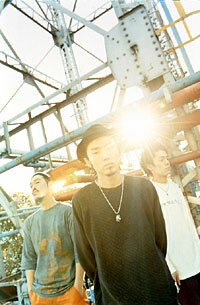 Originally a quartet, the band's first singer left in 1999. Ooki Nobuo took over on vocals a year later, and the group concentrated on becoming prolific songwriters. Acidman released a single and an EP independently before signing to Toshiba-EMI, where the band's debut album Soo showed an impressive return. A year later, Acidman's second album, Loop, cracked the Oricon Top 10 album charts, and the band remains a strong seller. Acidman released a third album, Equal, in September 2004.